Sir Terry Pratchett died yesterday. Other people have eulogised him better, much like with Iain Banks I never met him so I have no personal encounter to share, but also much like with Iain Banks he was one of the reasons I wanted to become a writer. Maybe even the main one. I started reading the Discworld books back in primary school, an act of pure pretentiousness as I didn't understand most of the jokes or themes at the time, but slowly I came to appreciate them for what they are. Small Gods is a masterpiece. It's terrible that such an awful disease struck him so (relatively) young, but from what I can glean it sounds like he passed with dignity and grace. He'll be missed by many. RIP. IT IS 2015. IT IS THE FUTURE(R). Glorious Sunset by Utagawa Kuniyoshi, ukiyo-e, 1846. 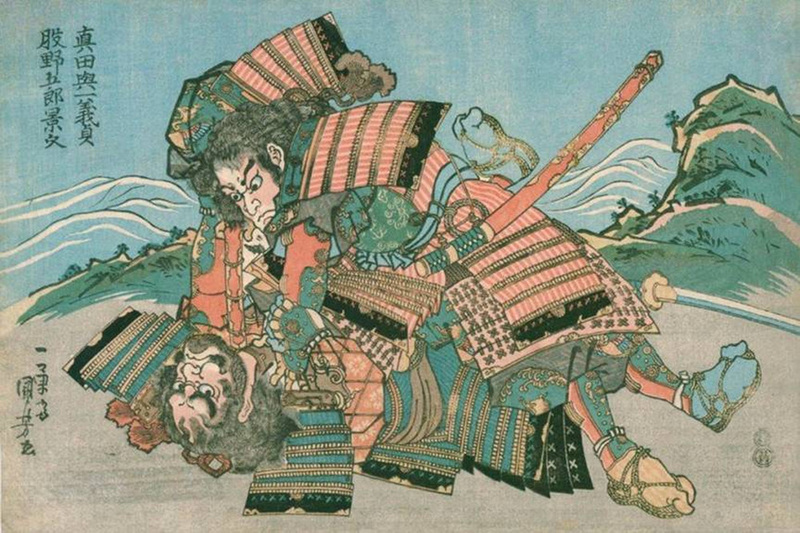 The ronin Miyamoto Musashi defeats a gang of bandits near a water mill. I will have something concrete to announce here very, very soon.